Yesterday we celebrated the life of my Mother, who passed away July 20, 2011, at the First Parish Unitarian Church in Norwell. It was a perfect tribute to her- she was a warm, talented, funny, beautiful person. I miss her but know in my heart that she is at peace . 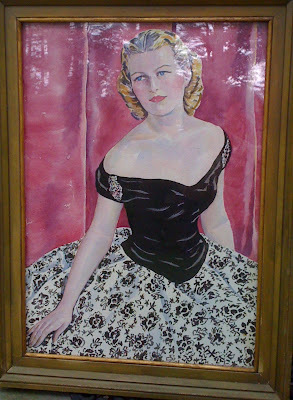 This painting was done by artist Catherine ( Stevie") Goodnow of Scituate. 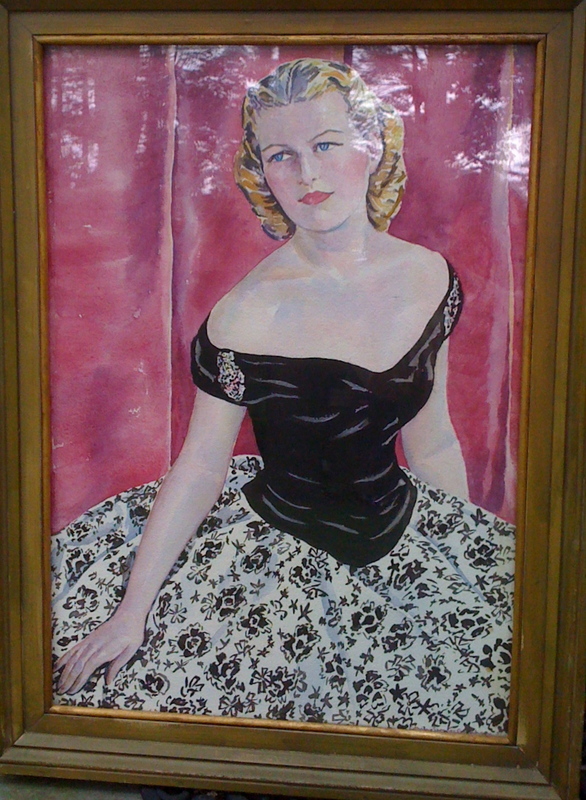 It was painted for the play "Laura" in which my mother had the lead role. It was always in our house growing up, and is my favorite image of my mom. Now I get to have it in my home. 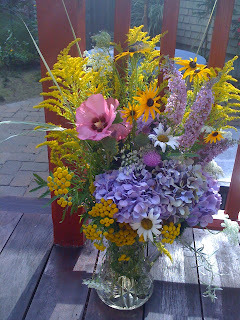 This arrangement for the alter yesterday is from all of her children's yards and gardens, in her cut crystal pitcher. I haven't felt much like painting lately, but I might attempt it today in watercolors. Absolutely beautiful Sally - the painting, the flowers and the sentiment. I'm so glad you had such a nice day for the service. What a nice tribiute to your mother and how very nice to have the painting. The service was just perfect for your dear sweet mother. I just know she would have been thrilled about it. You and your siblings did an amazing job putting it all together. Thank you for sharing her life with us. Sally, what a beautiful painting of your Mother. How nice to have such a beautiful memento of her that you will be able to enjoy forever. Thinking of you and your family. I hope you find comfort soon...wishing you well in your new excercise venture.